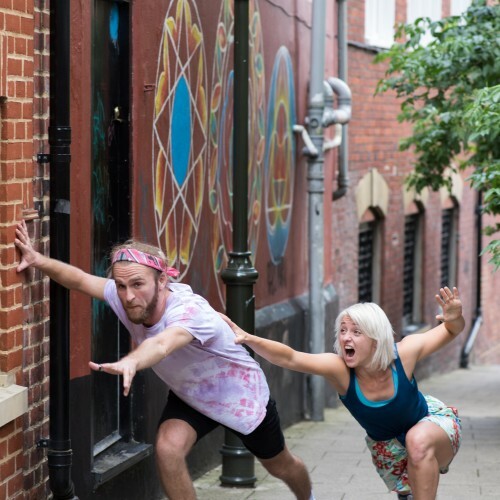 A surreal and comic dance theatre performance for the street. Us is a re-telling of the classic 'boy-meets-girl'. The boy, Luke, is a notoriously flirtatious, young at heart, Luke Skywalker wannabe, but it's complicated. Audiences watch their story unfold from nervous beginnings to eventually falling in love. This comic and touching dance performance reveals the trials and tribulations of young love. Will they make It work? What happens next? The audience help them decide; should they stick it out or go their separate ways? ‘Us’ seeks to bridge the gap between contemporary dance and traditional street theatre. It is an accessible performance yet still challenges audiences with its unexpected twists. Expect laughter and audience participation. The performance is available for touring from 2016 onwards. It is a 2 person cast with 3 people on the road for touring. The show is completely self sufficient and comes with it’s own sound system. 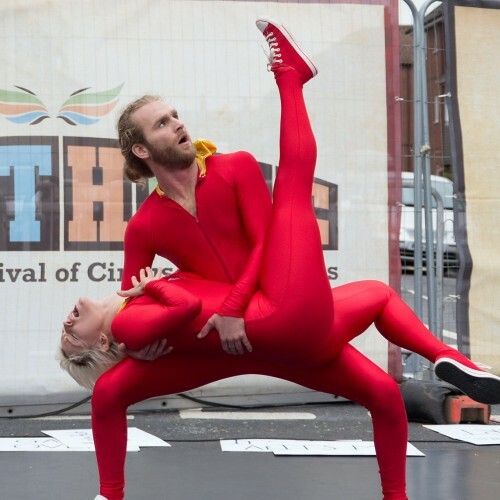 The show is very adaptable and can be performed on the street, in parks, just about anywhere!